Comment moderation is active, and I've been experiencing a bit of trouble with some of the comments disappearing for a while and then coming back while in queue. So if you left a comment and don't see if up within a day or so, please feel free to repost it. I'm sorry if any comments got lost in the shuffle! Happy Friday. I've been in a really wonderful mood lately, and I might be landing a job soon on top of my internship with FASHION NINJA. So here's hoping! Also, since the weather has been getting warmer, I've been using less makeup. 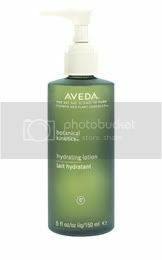 Instead of the usual amount of Almay's liquid foundation, I've been using half (about dime size) and then adding Aveda's Hydrating Lotion (about half a dime). The result is an extremely light base that glides smoothly over skin while evening the tone and keeping a light, natural glow. Perfect for spring.